Photo credit: My P, aka binaryape on Flickr, took this photo the other day, on his way to work. I’ve also been stepping over the spill of pins on my way to the office, and yesterday I stopped resisting the temptation to pick them up. A few years ago, my then joint managers gave me some strong magnets as a Xmas present (I was covering over the holiday period, and not only did they feel a bit guilty, but they are both nice, gift-giving types, and knew I would love the magnets) which I usually use to hold a phone list to my in-trays. The magnets are very good for picking up pins as well. 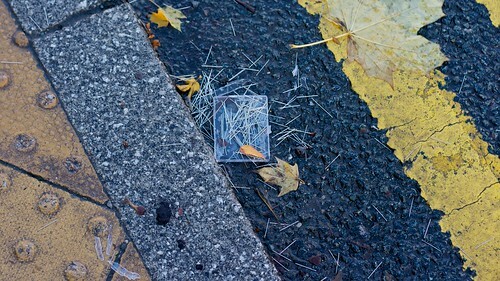 When I first saw the spill, I thought someone had just dropped a new box of pins, possibly someone in the garment industry that still exists locally, even if it couldn’t be described as thriving. However, closer investigation shows that the pins are actually a mix of different types of pins and needles, more like a collection than a fresh box of supplies. Though it could still be from a professional, I suspect the pins may have been dropped by someone more like me, a craft enthusiast, who experienced a supplies box failure while walking down the street, maybe to go to a sewing course or something like that. Or it could have been a student. Anyway, I now have a collection of dirty, rusted and/or bent pins and needles, plus some possibly usable ones. Why would I want them? Well, recently we re-watched the Street of Crocodiles, and it made me want to make spooky dolls, using bits of wire and old light bulbs. (As an aside, another of the shorts on that CD featured using magnets, and now I’m wondering if that’s what linked the two things in my mind?) The pins would be excellent for that type of thing. And until I get around to that, they don’t add that much to my piles of stuff to craft with. Not really. Honest.